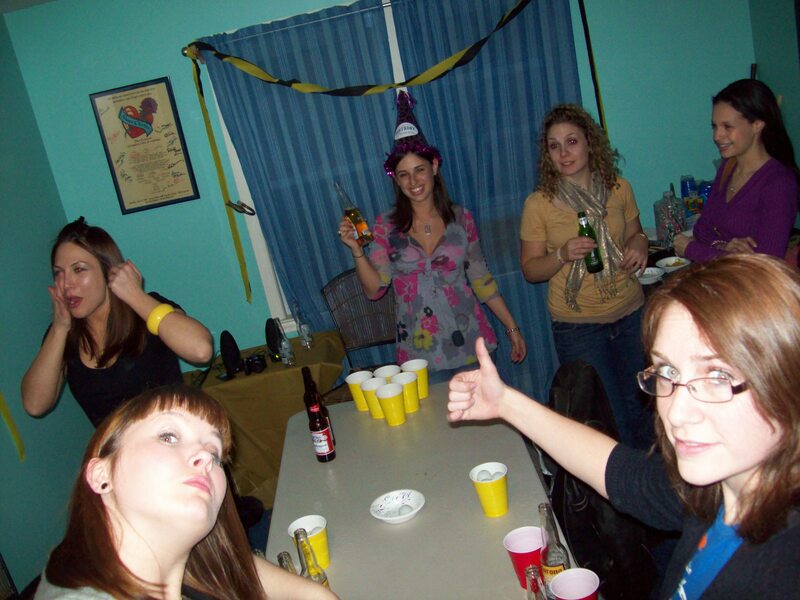 Since college, I have loved throwing parties. I loved to party in high school, but I learned from my brother’s mistakes that throwing parties when Mom and Dad are away is just not worth it. It was so much easier to go to a keg party, or chalk my ID and go to the bars, or let someone else risk the cops breaking up their house party. I went to a college that had 25,000 undergraduates. The campus alone was as big as my hometown, and I lived in the most populated area of campus, so it was hard for security to break up dorm parties. Dorm parties were crazy fun, especially if you could get your whole floor involved. House parties were even better when we moved off campus and actually had houses to have them in. After college, parties were put on a hiatus as I returned to my parents’ home. But it didn’t take long for them to pick up after I moved out. It was a perfect storm for epic house parties. I had a few girlfriends that lived near by and my good guy friend (and future boyfriend) had just moved down. Soon after, his good friend from high school moved into the neighborhood. We all lived so close to each other, and my future boyfriend’s apartment was perfect for parties. If only he had a woman who could help him pull it all together… Our team was built. We don’t have these parties all too often. They require so much planning and prep time and are much more memorable since they are rare. But all the same, we love having them because everyone comes out of the wood works. Some of our friends we only see when we have these parties. It’s a great excuse to get together. We usually plan them around a special occasion and when my girls from Boston are in town. They almost always have a theme, always have movie reels made by my boyfriend, party gags, games, music and good people. Good people. That is key! A bad mix of friends can be a disaster. There have definitely been occasions where personalities have collided and things got sticky. Our parties are definitely memorable by all accounts. Parties when you’re young are full of stupid behavior – people trying to get some, or people getting too drunk. Most of this stupid behavior comes down a notch at parties nowadays. People hold their own and if they meet somebody, they don’t try to lock themselves in one of the bedrooms. Parties are just about chilling with good people and acting a little silly, while still respecting your hosts and knowing when the party is over. I’m super pumped you picked the best worst picture of me ever. But leave it up. Parties are great, and I agree with you, I’d hate risking it at my house. Un/fortunately, we host the 4th of july BBQ every year at my house…and last year made me ban it for the indefinite future. These are people in their late 30’s…getting inappropriately wild, spraying silly string all over my house and brand new furniture, having food fights INSIDE my house, there is still blue cupcake stains on my ceiling and green silly string cemented to my ceiling fan. They just throw their cigarettes in the backyard where my and my neighbors dogs play, throw pop tops in there to make it impossible to mow the lawn. Leave dirty cups and plates everywhere and feedin my dog chocolate. Seriously? You’re old enough to have a mortgage and a midlife crisis for christ sake…why are you exploding firecrackers in my kitchen?? I live in a snooty neighborhood, I’m better than this. That couch that you just dropped a BBQ rib on was $1800! I spent 7 hours cleaning this house for you a-holes. It was like I was having a nervous breakdown and I had 45 38yr old drunk babies to take care of. It took me 8 days to clean up the mess. 8 effing days. I vowed NEVER to have a 4th of July BBQ again…. ….till I was convinced by previous guests to have it again…this time, they know I’m not putting up with ANY shenannigans. We all can be convinced to have a party again. No matter how bad the shenanigans are! PS, I was trying to find a crowd shot but couldn’t find one anywhere. Well said! You hit the nail on this one. I love to have house/apartment parties. We get to go to bars all the time and we do that! So when you have a house party you can step away from that and throw yourself into another world. I have such a blast when we do this no matter the drama that comes. But the vide has changed since high school/ college as it should. It’s more about having fun and chilling out, seeing people you don’t see all the time and just having a good time. I love the mix of people and a good mix just like a drink can = a lot of fun. I plan on having parties and BBQ’s and whatever I can do that fits in these categories. I am blessed to have a great GF and amazing friends that share the same feeling. It can be 50 people or just 5 people and the main goal is just to have the right mix and the right vide and that is always a good party.